The Lifestyle Screen system is a fully spring loaded garage door screen that works with your existing garage door. The garage space is one of the less revered areas in the home. For many, the garage has become a conservation site for critters and clutter. Animals and more junk always move in and nothing seems to move out. Therefore, you may be a little surprised to learn it is possible to transform your garage space into a haven for parties, an exercise room, a relaxation spot, and just about any other thing you feel like. Installing a screen on your garage door prevents animals and other uninvited guests while keeping the place well lit and fit for various purposes. The Lifestyle garage screen door is easily the best among the available screen door options. You’ll be doing your garage a huge favor by installing this fully retractable screen door. The Lifestyle garage door screen is designed to work seamlessly with your existing garage door. This design facilitates a smooth installation process and ensures that the safety of your garage space is not compromised. The screen door is fully retractable and is also accompanied by an equally fully retractable passage door. The passage door eases entry into and exit out of the garage space. 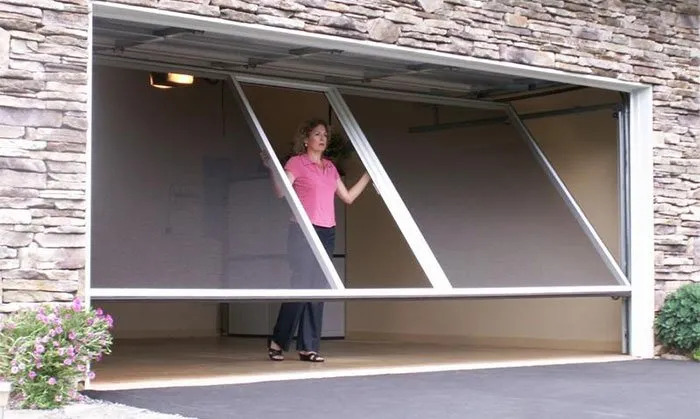 You do not need to retract the entire screen as with conventional garage screens or worse, retract the entire door as with regular garage doors. The Lifestyle garage door screen can be installed on the first visit to your garage, a luxury you cannot enjoy with Aluminum sliders. The screen is opened and closed manually, ensuring you do not have to struggle with wiring or remote control systems. To further facilitate smooth entry and exit, the door screen is spring loaded. Opening and closing the screen door is easy as pie. Due to the fact that it works seamlessly with your garage door, the screen is hidden from view when not in use. Whenever you’re done enjoying the cool ambiance of your garage, you can simply retract the screen door and then close your garage door as you’d normally do. Perhaps you’ve been mulling over installing a garage door screen but the current prices of a motorized roll-down screen or an Aluminum screen have put you off. This innovative screen from Lifestyle is the perfect option for you. You do not have to break the bank to install one and it works excellently. Furthermore, it doesn’t require approval from most HOAs. The screens are sold through professional dealers in Canada, the United States, New Zealand, Australia, and beyond. You can visit this link to contact a professional dealer near you. You say you sell in Australia, but I cannot find any links for Australian Dealers. Could you please add a link to an Australian dealer or get them to email me please, with prices for a double door and a single door. Can you adapt this for verandah’s ? ?